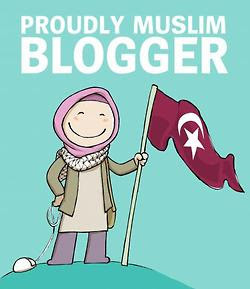 I'd like to take advantage of my blog to share with the world a little about me as a Muslim. I know, due to the overwhelming biased media, that most people know little about what Muslims really believe or what Islam really teaches. There are plenty of misconceptions and I'd like to take the time to try and dispel those misconceptions. Thus, I'm introducing Muslim Mondays! Now, with that said, I'd like to start by saying you can't judge Islam based on the actions of Muslims. In every group there's a bad bunch - just like there are Christians who beat their wives, or drink or do bad things - that doesn't mean that Christianity itself is at fault... likewise, Islam is not to be faulted for the bad actions of those claiming to be followers. So what does Islam mean? Islam by definition means to submit, surrender and obey in peace and sincerity to the will of God - anyone who does this is a Muslim. It also means you believe in only one God, and Muhammad (peace and blessing be upon him) is the last and final prophet of God (Allah) - ending the long line of noble prophets before him, Noah, Abraham, Moses, David, Solomon, Jesus, etc... (peace and blessings be on them all). Muslims believe in God, the Creator, the Sustainer of all the universe. We don't believe in a sun god, or a moon god. We believe in The One and Only, God - which translated in Arabic is Allah. We also believe in the sacred texts which have been revealed - essentially known as the Bible - the Torah, the Psalms, the Gospel. However, these texts have been changed by man and are no longer in their original form - and they have many errors and inconsistencies. God is perfect and His word is perfect - these texts are not and can no longer be considered the words of God. It was not until the 20th century that scientists have confirmed our bodies are made up of every element found from the earth/ground/dirt. The Bible also talks about man being created from clay/dust/dirt... however, God gives further explanation in the Qur'an and gives details about how the embryo is formed in the uterus. Science has confirmed the stages of the development of an embryo/baby in the uterus and the descriptions found in the Qur'an coincide with those stages. There is no way possible for a man more than 1400 years ago to just make that up. That "information" came directly from the Creator alone. Of course there is much more that makes me believe in the Qur'an - but if I had to pick one example - this would be it. Therefore, I follow the teachings of the Qur'an as they have been preserved and protected and not changed by man - so they remain the true Word of God. It's official - I'm very annoyed/frustrated/angry! Yesterday I weighed at the same time I always do wearing the same thing (nothing - lol) and I technically didn't lose any weight. So why did I report I lost 1.6 pounds yesterday - well, I took a sneak peak on Thursday morning at the same time and I weighed 248.4. I knew there was no way I was suddenly 2 pounds heavier overnight - so that's the weight I decided to record. Well... today I wanted to see what the scale said just to make sure I had an accurate weight and guess what the good scale had to say this morning? 246.2! Are you serious? On my actual weigh in day I lose nothing - but the day before I lose 1.6 pounds and the day after I would have lost 3.8 pounds! I'll stick with the weight I previously recorded (248.4) - but now I'm beginning to wonder whether the numbers are accurate at all! I've worked really hard all week - so the 3.8 pounds sounds about right because I walked 30+ miles and worked out 10+ hours. I guess I'll just have to wait and see how next week turns out. ARGH! 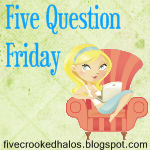 If you would like to play along with 5QF, head over to My Little Life and link up! 1. If you had $1,000 to donate to a charity, which would you choose? Of course I would donate it to my local masjid (mosque), especially during Ramadan so they could use the money to feed those who are fasting! LOL - Thankfully, living in Southern California - San Diego specifically, we don't have snow days! Welcome sunshine in the middle of winter! 3. What talent did you wish you had and why? Ahhhhh, excellent question. When I was little I always wanted to be a figure skater or tap dancer. As an adult, I wish I had the talent of being the "perfect" mom! You know, the one who never yells at her kids, loses her cool, etc... for now I'll just accept my talents as a struggling mom! 4. Are you a news, politics or celebrity gossip junkie? I'm not really into politics - I keep up to date and all - but I'm just not into the political drama! However, I'm definitely one for news and I'll admit- I take guilty pleasure in keeping up with some of the celebs... I'm just not obsessed! 5. What is your favorite "cocktail"? (Are you a beer person, a kiddie cocktail junkie, or perhaps your more the "Cosmo" kind?! Anything flies...doesn't hafta be alcoholic!) As a Muslim we don't drink alcohol - so my absolute favorite drink is strawberry lemonade! Last week I got a little depressed about not losing at least 2 pounds. I know I should be proud of 1.4 pounds but when you have so much weight to lose you really want to see it come off a little faster than a pound at a time. I desperately want to be below 200 pounds! UGH! Instead of letting it get me down I decided to try even more. I upped my exercise and decided to work out a little longer and a little harder. I continued to eat healthy - although I did have one splurge this week - sushi (it's my kryptonite). I didn't overdo it but I came close! I have to allow myself the occasional sushi day in order to stay on track, otherwise I feel like I'm being deprived. While I admit I'm still a little frustrated that I didn't lose at least 2 pounds, I'm happy that I've lost so many inches, especially from my hips! I think at this point I'm going to give up hope on losing 2 pounds a week because it hasn't happened for so long despite all my hard work to make it happen! I'm losing weight and that's what is more important! iPhone 4 or iPhone 4g/5? A few weeks ago Apple replaced my iPhone 3G because I was having issues with it. It was nice that they replaced the phone with a new one, but I was still stuck with the outdated 3G model. Bummer! I really need an upgraded iPhone - why? Well, because I'm a brat. And... I could use the newer features. Yesterday I wanted to use two apps at the same time - which you're not able to do on the iPhone 3G. I wanted to be able to listen to something while I went on my walk but I also needed to use a tracking app to record the time and distance of my walk. With the new iPhone you can do "multi-tasking" so you are able to use more than 1 app at a time. Today I wanted to video record Ilyas and his temper tantrums so I could post it to the blog so you could all witness what I have to go through several times a day, every day. Unfortunately, the iPhone 3G doesn't have video options but the new phone does. I've already made up my mind to upgrade. 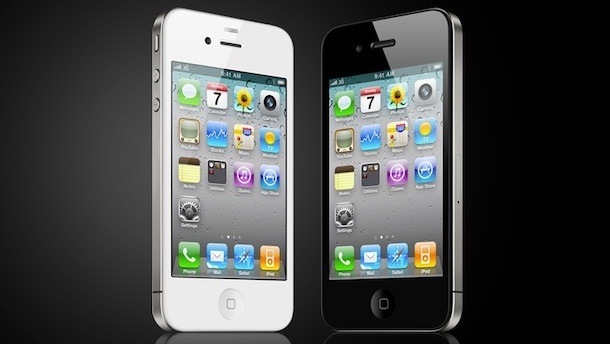 The only downside is I really want the white iPhone and the white iPhone 4 hasn't been released yet. Online rumors suspect it will be released soon - sometime this spring. The question now is whether I should just tough it out for a few more months and wait for the next generation iPhone which is expected to be released in July 2011 (supposedly). That's my dilemma... what would you do? Some of you who've been keeping up with me know that I'm Bipolar. But what exactly is Bipolar? Well, the simple explanation is that Bipolar disorder involves periods of abnormal excitability or irritability (mania) alternating with periods of depression. The "mood swings" between mania and depression can be very abrupt but can also last a long time. There are also "mixed" episodes in which features of both mania and depression are present at the same time. I'm more prone to cycle through manic states and when I do cycle through a depressive state it gets really bad - like suicidal ideation bad and I'm not able to function - even small everyday activities are next to impossible. However, on the upside (as much of an upside as I can get anyhow) - I can fully function when I'm "manic." Unfortunately, my mania really affects my family and relationships, particularly the kids because they're with me 24/7. Now, I'm supposed to be on medication... however, my doctor and I have been having a really hard time with medications this last year. I've experienced terrible reactions to one medication and I gained a SIGNIFICANT amount of weight (60+ pounds) from other medications. Because of that I have had to switch medications a couple times now. My most recent medication was also causing me to gain weight even with carefully watching and tracking what I ate. I stopped taking it. I just couldn't afford to gain any more weight. I'm currently on no medications and unfortunately my doctor is on maternity leave so I have to wait another two months before I can be seen again. How exactly do I cope? Well, it's definitely easier said than done... some things act as triggers such as homeschooling Aaliyah when she's uncooperative, or trying to explain something and she just doesn't get it whatsoever, that usually sets me off. When my little triggers go off, I take a break. It's all I can do before completely "losing it" and coming unglued. On the upside, I've been researching all my medication options - frustratingly most of the medications used to treat Bipolar also cause weight gain, and it's especially pronounced in patients who are already overweight/obese such as myself. I'm working so hard at eating healthy, controlling my portions, and exercise that I do NOT want to see it all go down the drain because some little pill I swallow everyday makes me gain weight. I'll keep you posted when I finally get in to see my doctor! Heat oil in a large, heavy pan over medium-high heat. When hot, put in the cinnamon sticks, peppercorns, cloves, and cardamom. Let the spices sizzle for a few seconds. Put in the onions and fry until they are light brown. Add the curry leaves and ginger, then stir for a minute. Add the lamb and stir it around for 3-4 minutes. Now pour in 4 cups of water and bring to a boil. Cover, turn heat to low and simmer for 40 minutes. Add potatoes, carrots, salt, and chili powder. Stir and bring to a boil. Cover and turn heat to low, and cook 30 minutes or until the meat is tender. Crush a few of the potato pieces against the side of the pan to thicken the sauce. Stir and bring to a simmer before serving. Serve with plain long-grain white rice. 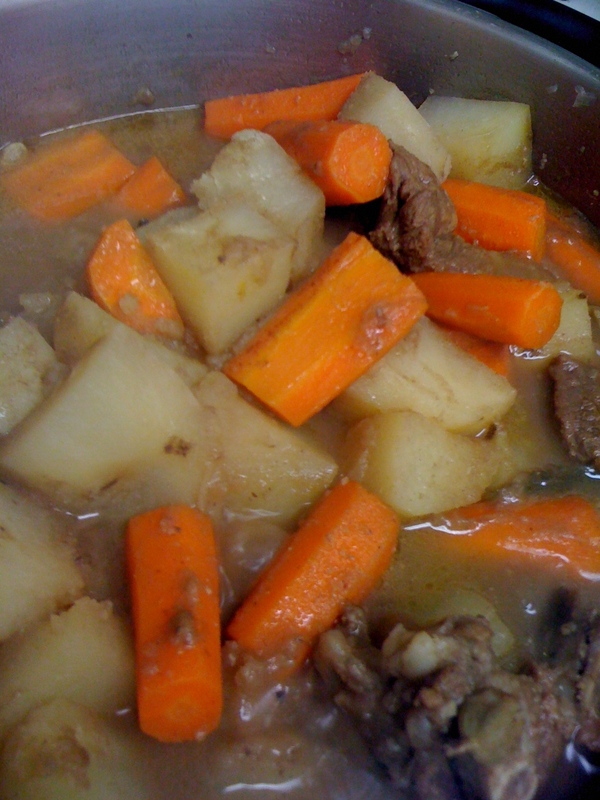 Weight Watchers: 8 pp per serving = 3 oz lamb, 4 oz potatoes and 4 oz carrots with about 3 tablespoon of sauce. Prepare pasta according to package instructions (omit oil, if called for). Drain and set aside. Melt butter in a large sauté pan over medium-high heat. 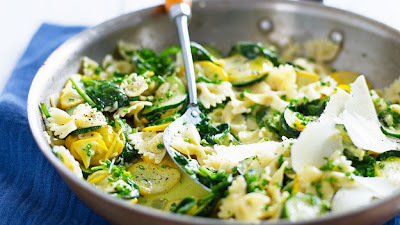 Add chopped red onion and zucchini/yellow squash, sauté for 7 minutes or until the zucchini/yellow squash is tender-crisp and slightly browned. Add tomatoes and cook for 1-2 minutes or until tomatoes are heated through. 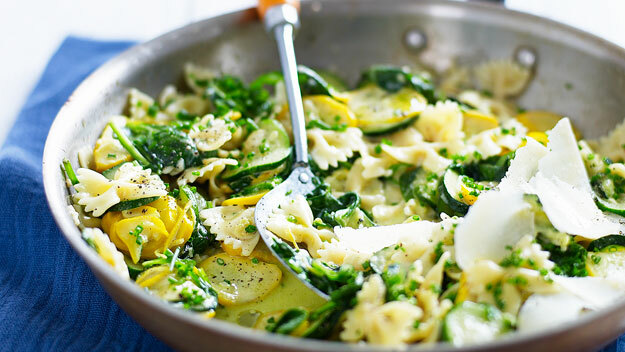 Remove from heat and stir in Parmesan cheese, lemon juice, basil, salt and pepper. Add cooked pasta to the pan and mix well. Serve with a tossed salad and garlic bread. The terrible twos have officially manifested themselves in my 2 year old. Now, I've been through this twice before with my daughters, each one different from one another. My oldest had outright temper tantrums and would scream and throw herself on the floor, hit her baby sister, etc... My second daughter would cry, cry, cry, and cry some more. In fact, she's still a cry baby and she's almost 5. However, my little man has truly topped the cake with his meltdowns. First of all, my daughters were going to spend the night with my parents. Naturally, Ilyas was mad when it was time to leave and his sisters weren't coming with us. He began screaming... he proceeded to scream almost the entire 25 minute drive back home until he screamed himself to sleep, literally. Of coarse, as soon as I parked the car at home he started up again! We went inside the house and I quickly ran to my room to change and that's when I started hearing the crashing sounds. Little man was in a complete RAGE. He was screaming, crying, throwing himself on the floor, then picking himself up only to start throwing anything and everything in sight. By the time I came into the kitchen he had toppled all of my baking pans from the side of the refrigerator where they're kept, he threw glass baking dishes from my cabinets (thankfully, for him, nothing was broken), he threw a couple cookbook AND my LAPTOP from the kitchen counter! I was livid and I admit, I momentarily lost my cool and start screaming too! It took another 10 minutes before he finally calmed down, ok, including me. My mother is always assuring me that I will miss these times when the kids are young - but my assurances are - I most definitely will not miss this age! Combine the first four ingredients in a small bowl, whisk until mixture is smooth. Line a baking dish or broiler pan with foil. 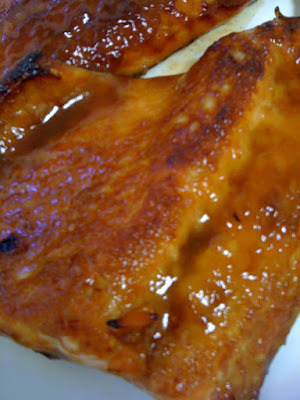 Place salmon fillet on top of foil and pour the sauce over the salmon evenly. Broil for 10-13 minutes, basting the fish with the sauce at least twice. Serve with rice and sauteed spinach. Today is my new weigh in day... I was initially on Monday's, then switched to Thursday's but changed to Fridays's because the days I tend to eat a little more is on the weekend and I always end up weighing heavier after the weekend. Don't get me wrong - I stick to the Weight Watchers plan like super glue - but if/when I delve into my weekly points, it's always on the weekend. Going into today's weigh in I'm a little apprehensive because all week I've been weighing heavier than I should be. I've been feeling a little bloated from what I suspect is PMS - so last night I ran to the drugstore and picked up some water pills to hopefully help cut back on the bloat and shed any excess water weight. I do know with all the exercise lately I'm rebuilding some lean muscle - and muscle does weigh more that fat. I've also noticed my pants are starting to feel a lot looser - and some pants I couldn't really wear I can wear now. YAY! PHEW! Now, truth be told I was really hoping to finally be below 250... however, I'm really excited to see a bigger loss than last week. I've worked really hard! Now, if I can only stop myself from peaking on the scale so much, I'm obsessed! I'm officially introducing Workout Wednesday! Every week I will post my workout results for the week and I will try and introduce a new type of exercise or activity we can all do. The Biceps Curl is a very popular exercise which works on the biceps brachii muscles. These muscles are located on your upper arms. When you do this exercise with your palms facing the ceiling, it is called an Arm Curl or Biceps Curl. However, if you rotate your forearms in such a way that your thumbs are facing the ceiling, you call this exercise a Hammer Curl. This Free Weights exercise is called a Reverse Curl when you hold the weights with your palms down or facing the floor. Each variation you perform strengthens the biceps in a slightly different way. You can do the Biceps Curl in different ways using different pieces of Fitness Equipment. You can do this while standing or sitting on a bench. 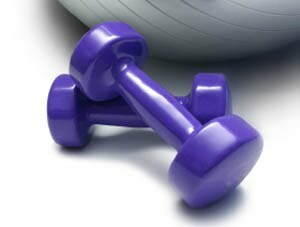 As for the equipment, you can use dumbbells, barbell, cables, or biceps machine. In this section, learn how to do the Biceps Curl with the use of dumbbells. STEP 1: Stand with legs slightly bent and feet hip-width apart. Place your arms straight and close to your body. STEP 2: Bend your elbows up to your chest. Straighten your arms and lower the weights to the starting position. The number of repetitions (reps) and sets you should do will depend on both your strength and skill level. It is important that you use a weight that is heavy enough to perform the desired number of reps and sets for your skill level while using good form. Try to increase the weight you lift by 5 - 10% as you increase your Fitness level. Depending on your Fitness goals, you may maintain certain weight and reps rather than increase them to build more strength or muscle. 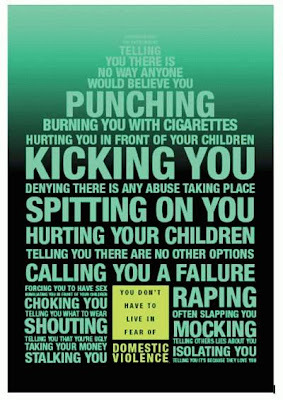 I was listening to the radio the other day when an ad/commercial came on for domestic violence against women. All of a sudden the commercial starts going on about how women staying at home and cooking, cleaning and caring for the kids is domestic violence! SERIOUSLY? Did I just hear that right? Wait a second! I was blown away! Since when is women having the opportunity to stay at home and provide for her family in ways she could never do if she worked outside the home considered domestic violence? I cannot even begin to fathom the ideology of the people who came up with that notion. 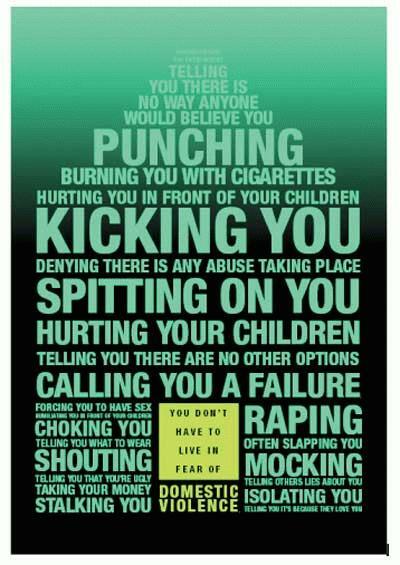 If anything, I'm very well protected by being at home and it's as far from domestic violence as you can get. I would argue the opposite - that EXPECTING women to work outside the home AND having to take care of the family is more "violence" against women. What do you think? Rinse, drain and pat the black beans with paper towels until dried. In a food processor combine the green bell pepper, jalapeño, onion, and garlic - process until finely chopped. Drain bell pepper mixture in a fine mesh sieve and press the liquid out. Return bell pepper mixture to the food processor, add black beans, egg whites, spices, cilantro, and panko breadcrumbs; process until well combined and mixture resembles a thick paste. Using a 1/3 cup measuring cup scoop the bean mixture and then form into patties. Place on a foil lined baking sheet lightly coated with cooking spray. Freeze patties for 30-40 minutes in the freezer. 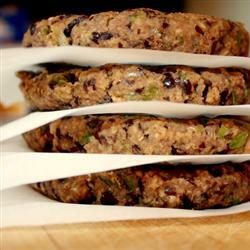 Preheat oven to 350˚F and place patties straight from the freezer into the oven and bake for 30 minutes. Serve on Whole Wheat Kaiser Rolls with lettuce, tomato, red onion, and other optional condiments such as ketchup and mustard (or mayo if you're not watching your fat/calories). Combine the mango, red onion, red bell pepper in a small bowl and mix well. Sprinkle with fresh lime juice. (Black Bean Burger recipe was courtesy of All Recipes and tweaked by me to be healthier - the mango salsa is my own twist! Yes, miraculously, we're still homeschooling! Halimah is about to start kindergarten in a few weeks and I will be officially homeschooling 2 kids! Admittedly, I'm nervous and a little overwhelmed... I've had more than a few panic attacks just at the thought of homeschooling both girls at the same time. I thought, maybe, if I share my fears with my husband he would reconsider this whole homeschooling thing and let me send the kids to a semi-private charter school. No luck... hubby said he would help teach Halimah's math and science instead. Honestly, kindergarten math and science are so simple that his teaching those subjects wouldn't be a big relief. However, at the same time it would be nice to give him a small taste of my frustration - especially when the enthusiasm for doing school starts to wane. I'm finally being more active with the kids - mainly because I'm starting to feel more like myself... I still have major irritability issues, but I'm much more active than I was before. Aaliyah is required to do at least 20 minutes of physical education every day - so we are now taking family walks through the neighborhood for 30 minutes or so. Yesterday we walked to the park, I let the kids play a little and then we walked back home. It was soooo hot, Halimah asked if we could go swimming instead. HA! Although I would prefer to send the kids to school, for my own sanity, I've pretty much succumbed myself to the fact I'm going to be forever homeschooling. However, the amount of homework kids get sent home with these days - it's probably better that we homeschool because at least I can enjoy my afternoons and evenings without having any homework - we get all the work done first thing in the morning! 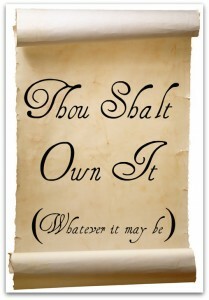 It's time to own it! I started back on my weight loss journey 7 weeks ago today; I'm doing great! However, I haven't truly "owned" where I started... mostly out of shame. I was ashamed at how far I let myself go before taking control of my body and health. And I was afraid to admit it to anyone, including myself. Granted, half of the reason why I gained so much weight in the first place was because of my Bipolar. I gained 40 pounds in 2 months because of the medication I was on at the time, then I went to Morocco and gained another 10 pounds because we were absolutely spoiled in Morocco and did nothing but eat, eat, eat and eat some more! After getting back from Morocco I gained another 20 pounds because I was pre-diabetic and I was hungry ALL the time - I would just eat anything and everything. I tried to stop buying the not-so-good stuff like chips but I was addicted to soda and was consuming it almost intravenously! I was really successful on Weight Watchers (aka WW) before - I lost 77 pounds on WW a few years ago and I'm ready to rock it out this time too! My goal weight is 135 - 140 - I have a total of 132 - 137 pounds to lose. I've already said goodbye to 15.6 of those pounds - so I have another 116 - 121 pounds to conquer! I can totally do it - but first I have to own it! I'm going to start weighing in weekly on my blog to share my successes, setbacks (if any - hopefully non), and my general feelings. Our Ordinary Life is featuring a giveaway for the new 2011 American Girl - Kanani! 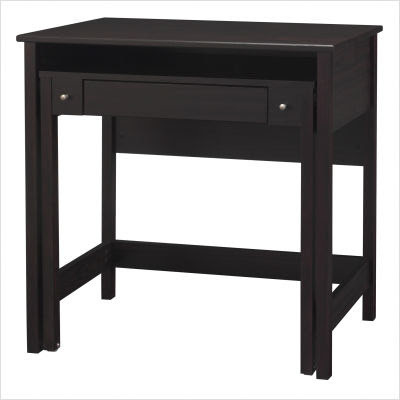 Head on over the Our Ordinary Life to learn more - CLICK HERE for more details.